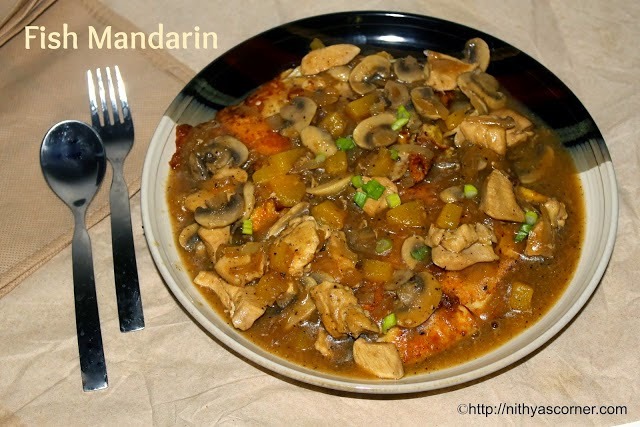 Fish Mandarin recipe is quite close to my heart. My mom came here to help me during my second pregnancy. My mom is a very good cook, and she tries out several recipes. On a Sunday, she asked us what could she make for lunch. My hubby suggested something with fish and my dad suggested chicken recipes. Finally, my mom landed up with this recipe. Mandarin is a type of fish but since we did not have Mandarin fish at home, we made it with Tilapia. It would look as if it takes a lot of time but actually not. It is quite simple and easy to make. When you make this recipe, you do not have to make anything else like side dish, curry or noodles. You can have it as such as it has chicken, egg, fish, mushrooms and pineapple. Even if you have very little quantity, your stomach will become full. My mom had it just like that, but I had it with rice. You can plan this recipe for a party also. My family liked this recipe. When your family members want chicken and fish for lunch or dinner, may be you can also try out this recipe. Hope you like it too! 1. Boil the chicken pieces in two cups of water. Drain and reserve the water/broth. 2. Keep the chicken pieces aside. Blend the eggs well in the blender. 3. Add corn flour and salt to the egg mixture and blend again until frothy. Now pour the egg mixture on the fish well. 4. Coat the fish well with the egg mixture. Apply two teaspoons of oil on a griddle and fry the fish. 5. Heat oil in a frying pan. 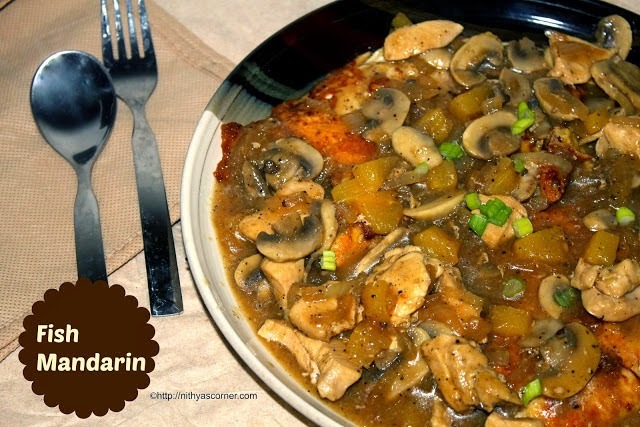 Add chopped onions, sliced mushrooms and boiled chicken pieces. Fry the onions, mushroom, and chicken for five minutes. 6. Add soya sauce and chilli sauce. Add pineapple chunks followed by pepper powder and salt. 7. Add a cup of reserved water/broth and corn flour (mix cornflour in little water) to the mixture, and boil well until the gravy becomes thick. 8. Arrange the fried fish pieces on a serving plate and pour the chicken gravy on top of it. Close the serving plate with a lid for few minutes so that the fish absorbs the gravy well. Now Fish Mandarin is ready! This entry was posted in INTERNATIONAL RECIPES(non veg), Seafood and tagged chicken recipes, Mandarin fish on November 22, 2014 by vikashbhardwaz. 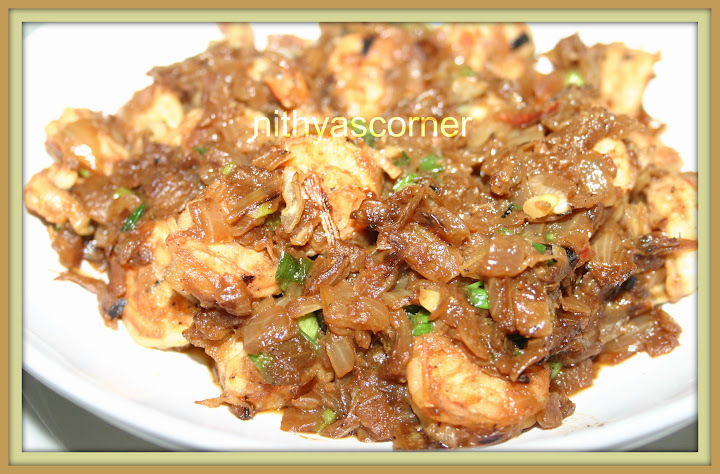 I found the recipe for Stir Fried Shrimps 10 years ago but made an attempt at it just few months back. I initially thought how this dish is going to turn out, as it did not have usual masala powders. I thought let me give it a shot. I cooked this dish in few minutes. The taste was nothing less than fantastic. I had it along with curd rice. I always love to take shrimp masala or any shrimp dry curry with curd rice. ..atleast a serving otherwise I would feel that my meal is not complete. Hmmm….again love to have this dish right away! Chopped garlic pods – 2 nos. 1. In a pan, heat butter and add shrimps and fry for 5 minutes. Sim the fire. 2. Add ginger garlic paste, onions, soya sauce, vinegar, sugar, and salt. Fry well. 3. When shrimps are cooked, switch off the stove. Now, Stir Fried Shrimps is ready!!! Wash, clean, and devein the prawns well. Do not cook shrimp for more than seven minutes, shrimps would become rubbery. This entry was posted in INTERNATIONAL RECIPES(non veg), Seafood and tagged curd rice, shrimp, Shrimps, Stir Fried Shrimps on November 22, 2014 by vikashbhardwaz. Wondering what the role of lemon is in this recipe? Not much…it is just used at the end just like any other Indian Fried Fish dishes (Simple Fish Fry (Meen Varuval)). I do not know why it is named like that. However, taste was very good. You should be careful while adding the sauce and vinegar as it may turn sour and salty. So be careful while adding them. The outer layer would be crispy enough and you can just have this dish as an appetizer or with noodles and fried rice (Egg and Soyabean Sprouts Fried Rice). Fish pieces – 20 nos. 1. In a mixing bowl, add all purpose flour and little water and make a smooth thick batter. 2. In a bowl, place fish pieces and add soya sauce, ginger paste, salt, and vinegar. Marinade fish pieces for 3 hours. Now coat the fish pieces in all purpose flour batter just before deep-frying. 3. Heat oil for deep-frying. Now deep fry the batter-coated fish in hot oil till the fish is cooked and golden brown on both sides. Squeeze lemon juice on top. Now, Fried Fish With Lemons is ready! Serve hot. This entry was posted in INTERNATIONAL RECIPES(non veg), Seafood and tagged Chinese Recipe Category, Fish dishes, fish pieces, Simple Fish Fry on November 22, 2014 by vikashbhardwaz.